Recommendations contained in the agenda are NOT decisions of the meeting. Please refer to minutes for resolutions. 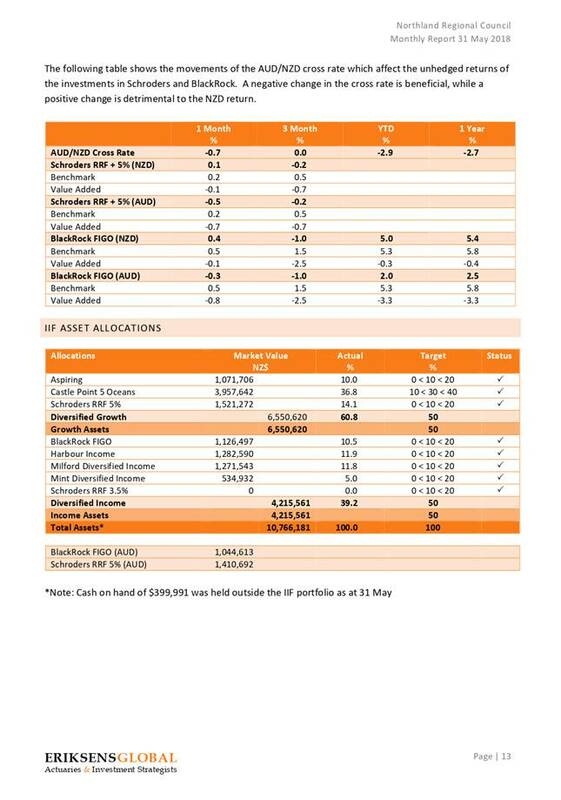 A summary of the returns and target objectives for the year to date period ending 31 May 2018 for each externally managed fund is presented below, with the supporting detail and fund performance for longer periods contained in Attachment 1. 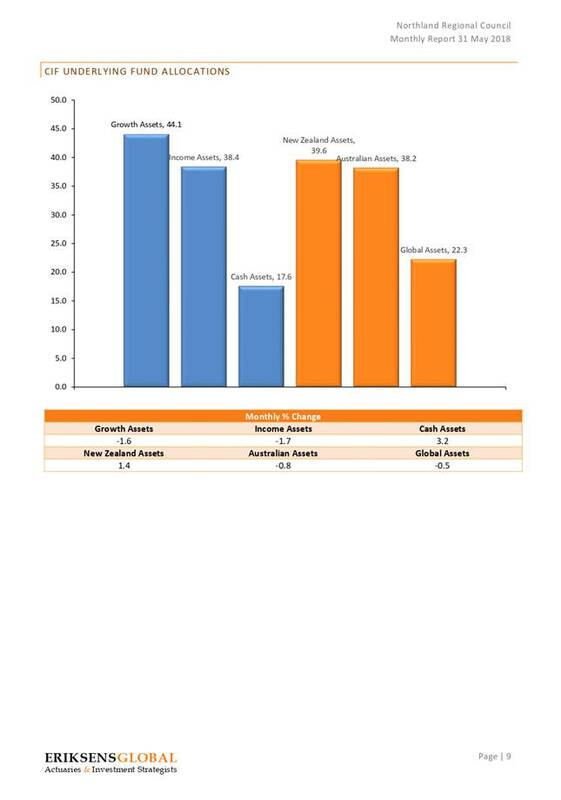 It is recommended that $399,991 is transferred from the IIF Mint Diversified Income Fund into the IIF Schroders +5% Fund when the NZD/AUD cross rate exceeds 0.94. This transfer will action a recommendation that has been on-hold while we have been experiencing near-term lows in the NZD/AUD cross rate. 1. 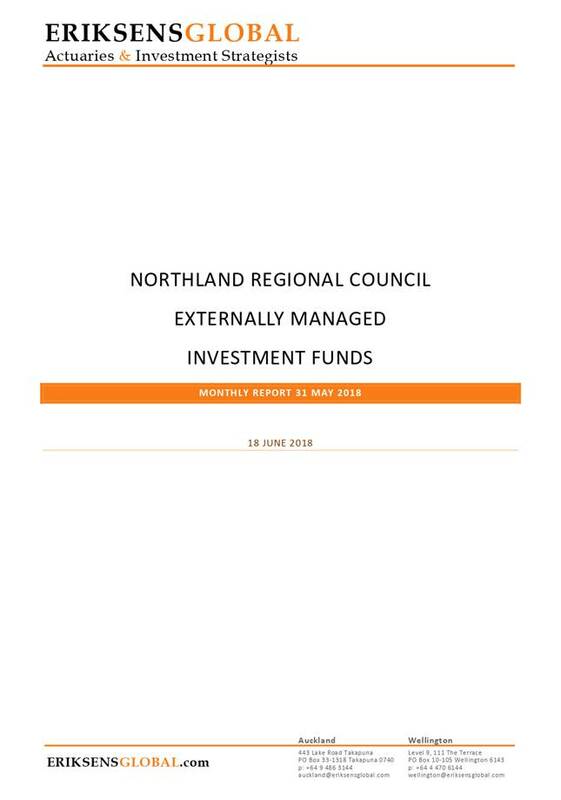 That the report ‘Performance of council's externally manged funds to May 2018 and transfer of IIF funds’ by Simon Crabb, Finance Manager and dated 19 June 2018, be received. 2. That $399,991 is transferred from the IIF Mint Diversified Income Fund into the IIF Schroders CPI +5% fund when the NZD/AUD cross rate exceeds 0.94. · On 8 June 2018, $399,991 was invested into the IIF Mint Diversified Income Fund. 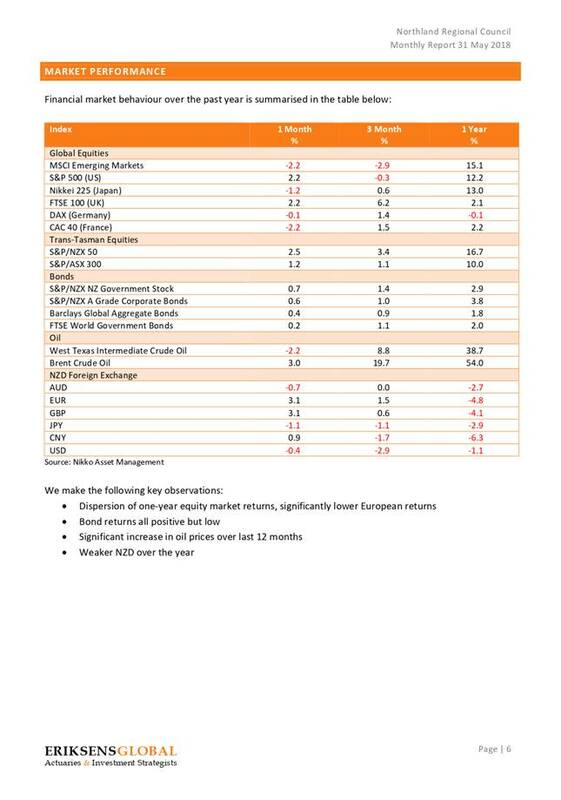 · Originally these funds were recommended for investment into the Schroders CPI +5% fund which Is denominated in AUD. This recommendation was not actioned as the NZD/AUD cross rate at such time was 0.92. 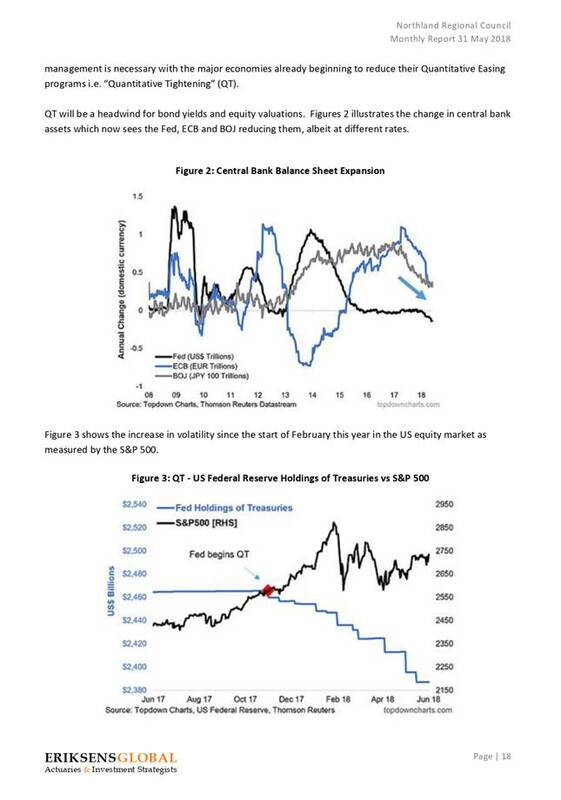 It was considered that investing at 0.92 would result in a foreign exchange loss on the back of a rising cross rate. · At the time of writing this paper, the NZD/AUD cross rate had increased to 0.934. 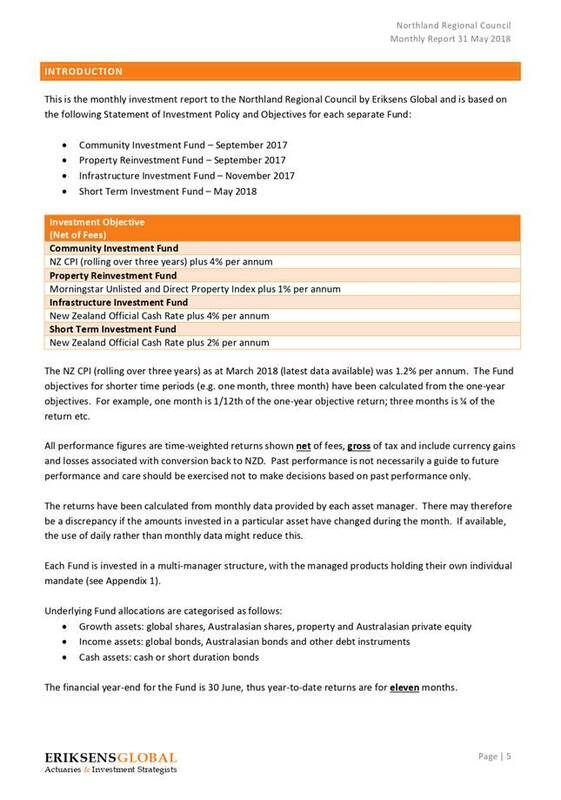 · It is recommended that original investment of $399,991 into Schroders is reinstated when the NZD/AUD cross rate exceeds 0.94, and is funded by transferring $400K from the IIF Mint Diversified Income Fund. 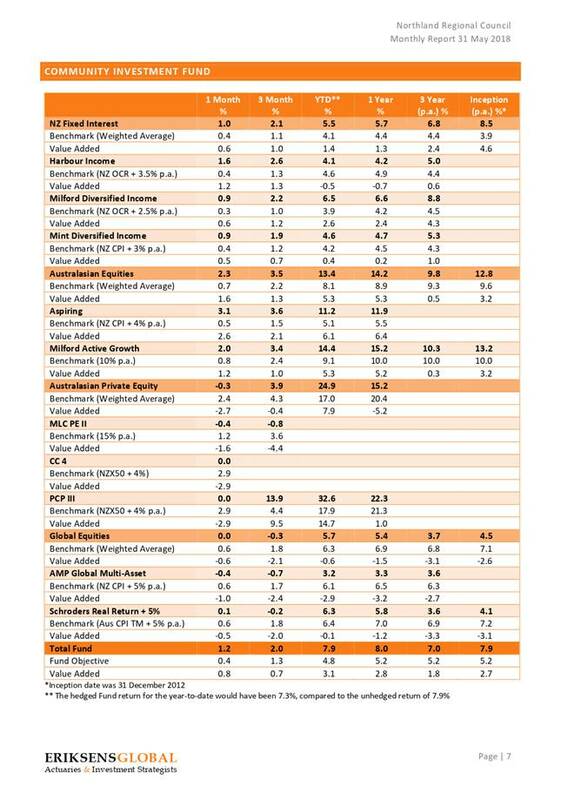 · The IIF asset mix will move slightly from 61% growth: 39% income to 62%:38% while the overall expected return of the fund will increase marginally. 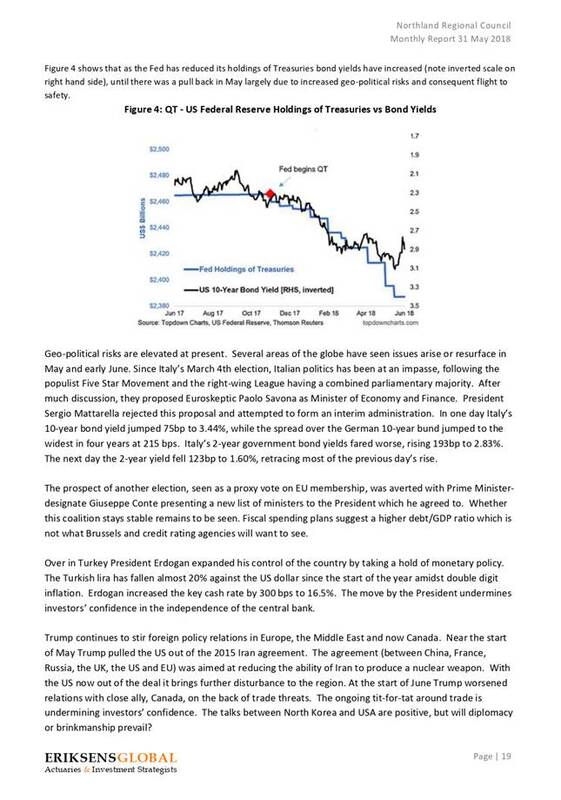 · This recommendation will reduce Councils overall exposure to the Mint Fund Manager and is endorsed by EriksensGlobal. 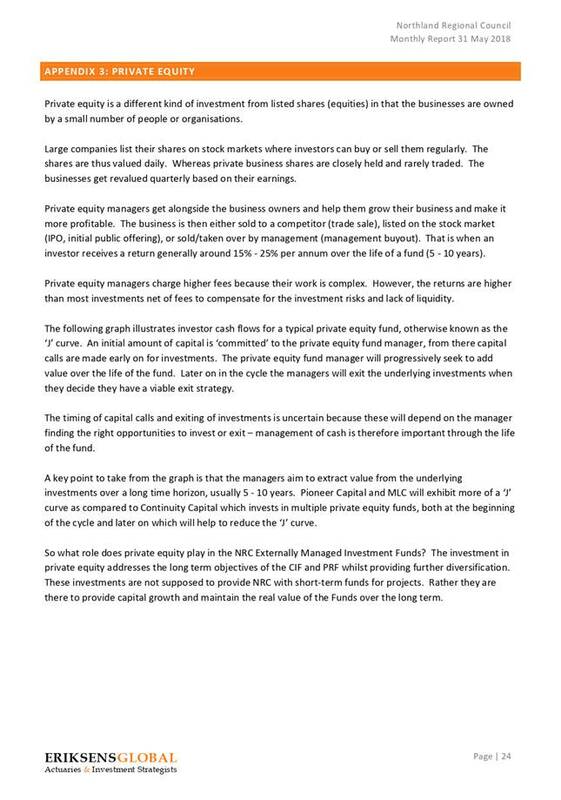 · There are no entry or exit fees associated with either fund. The Schroders CPI +5% fund is a defensively managed growth asset that targets a return of CPI plus 5%, whereas the Mint Diversified income targets CPI plus 3%, thus the Schroder fund ought to return greater gains in the current market. In addition, a $399.991 transfer out of the Mint Diversified Income fund will reduce councils overall risk exposure to Mint, which at the end of May was 19%. The Schroders CPI +5% fund is more aggressive than the Mint Income Fund and may suffer to a greater extent in a market downturn. The Schroders CPI +5% is denominated in AUD and will incur a foreign exchange loss (if not hedged) should the NZD/AUD cross rate exceed the cross rate that was in effect at the date of the transfer. 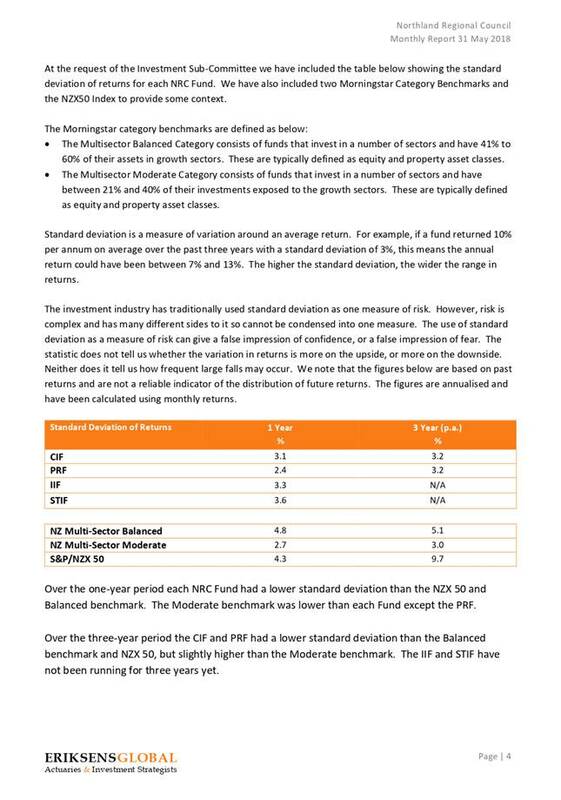 Mint Diversified income fund is more defensive than Schroders CPI +5% and may not suffer to the same in a market downturn. 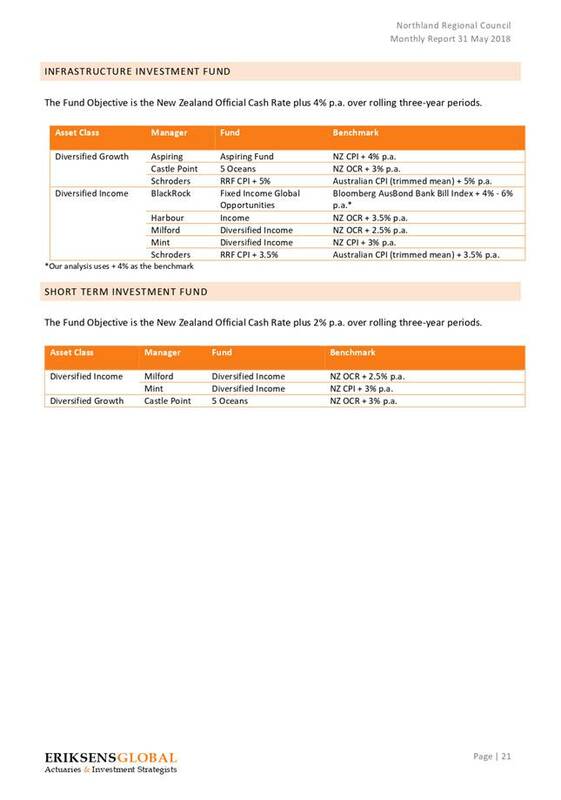 The Mint Diversified Income fund is not exposed to any foreign exchange risk. Continue to have a relatively high overall exposure to the Mint fund manager. In relation to section 79 of the Local Government Act 2002, this decision is considered to be of low significance because it is part of council’s day-to-day activities and is in accordance with the approved Treasury Management Policy. The activities detailed in this report are in accordance with council’s Treasury Management Policy, the 2015–25 Long Term Plan both of which were approved in accordance with council’s decision-making requirements of sections 76–82 of the Local Government Act 2002. Targeted consultation on the council’s intention to invest in externally managed funds was undertaken with iwi as part of the 2015–25 Long Term Plan consultation process using existing relationship channels. Investment strategies carry different risk profiles and are subject to different return volatilities. The returns from managed funds can fluctuate over a given time and period; and historical returns do not necessarily form the basis for forecasted future returns. There are no implementation issues that council needs to be aware of. When Council adopted the 2017-18 Annual Plan they provided for $1,422,029 of Property Reinvestment Fund (PRF) gains and $276,313 of Infrastructure Investment Fund (IIF) gains to be withdrawn and used as operational funding. For the eleven months to May 2018, the actual performance of these two funds has been good enough to allow a physical withdrawal of these two amounts, while still maintaining a better than budget reinvestment amount. 1. 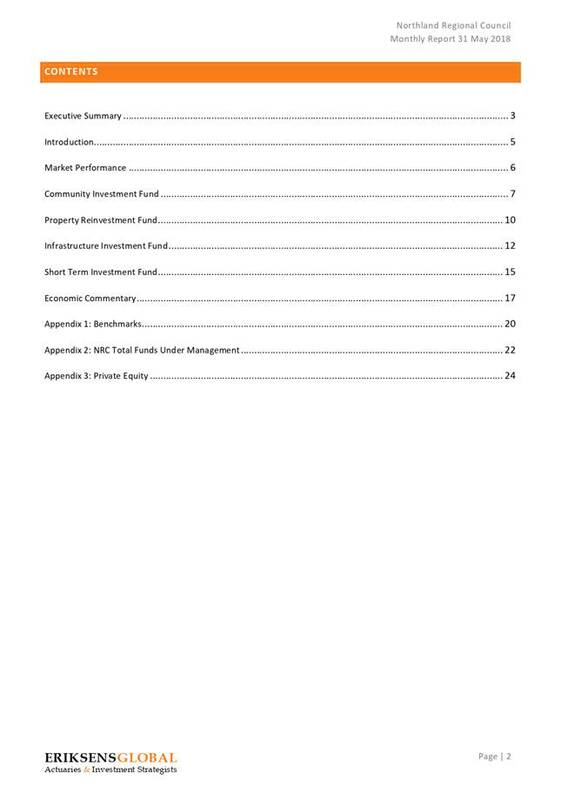 That the report ‘Transfer of managed fund gains to councils general funds ’ by Simon Crabb, Finance Manager and dated 19 June 2018, be received. 2. 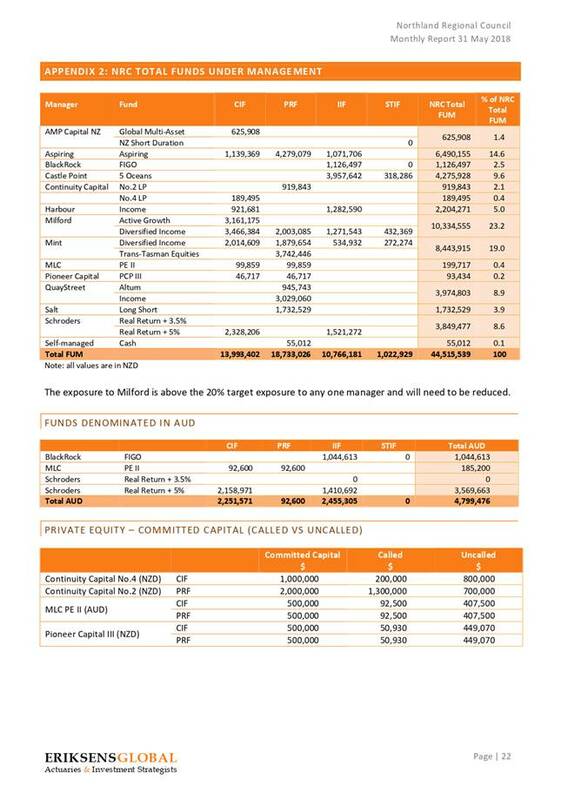 That $1,422,029 of gains are physically withdrawn from the Property Reinvestment Fund before 30 June 2018, in line with a recommendation from EriksensGlobal. 3. That $276,313 of gains are physically withdrawn from the Infrastructure Investment Fund before 30 June 2018, in line with a recommendation from EriksensGlobal. 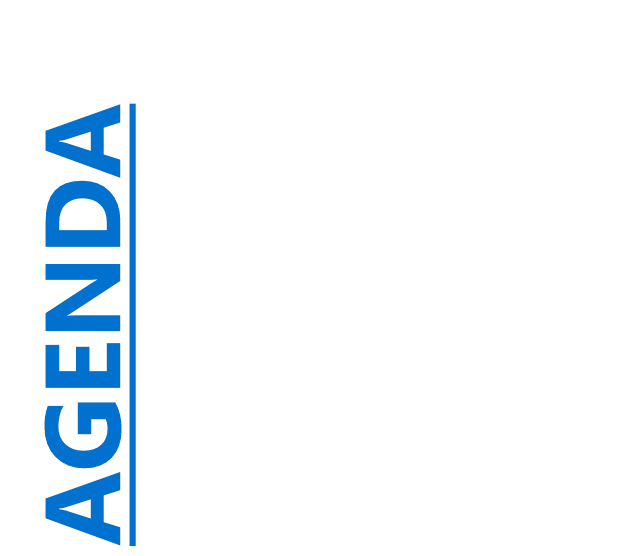 Council approved and adopted their 2017-18 Annual Plan on 27 June 2017. The budgets contained within 2017-18 Annual signalled that a portion of the gains earnt from each externally managed fund would be used as operational funding subject to each fund’s performance. 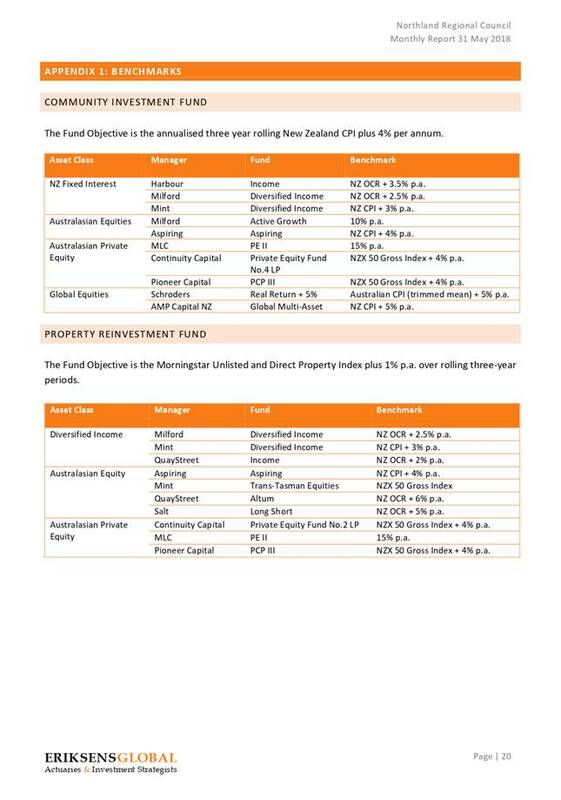 · The Property Reinvestment Fund (PRF) was budgeted to contribute $1.4M of its gains as operational funding. · The Infrastructure Investment Fund (IIF) was budgeted to contribute $276K of its gains as operational funding. 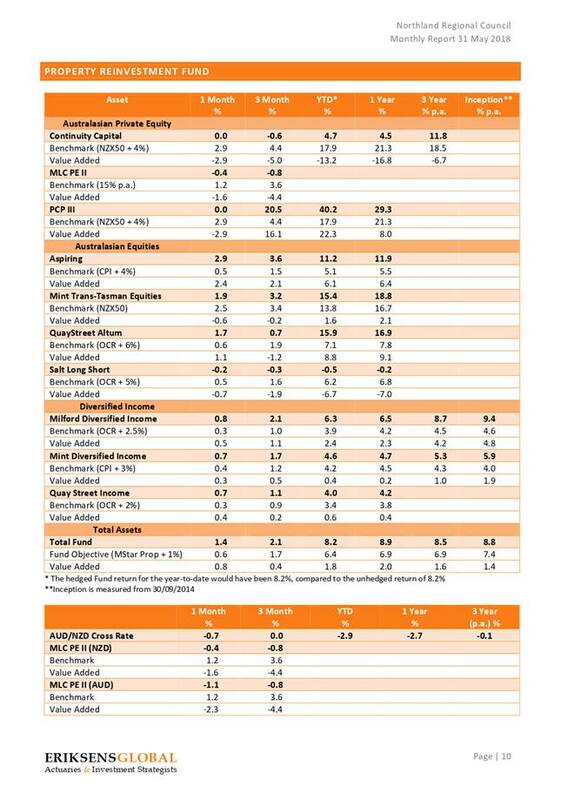 The actual gains earnt from each fund for the eleven months to May 2018 is presented in the following tables. 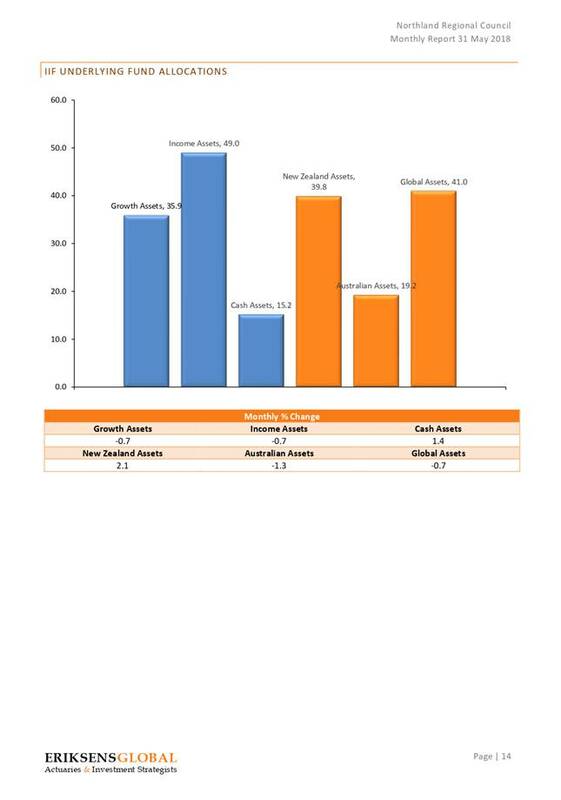 A comparison is made to the corresponding Full Year budget amounts. 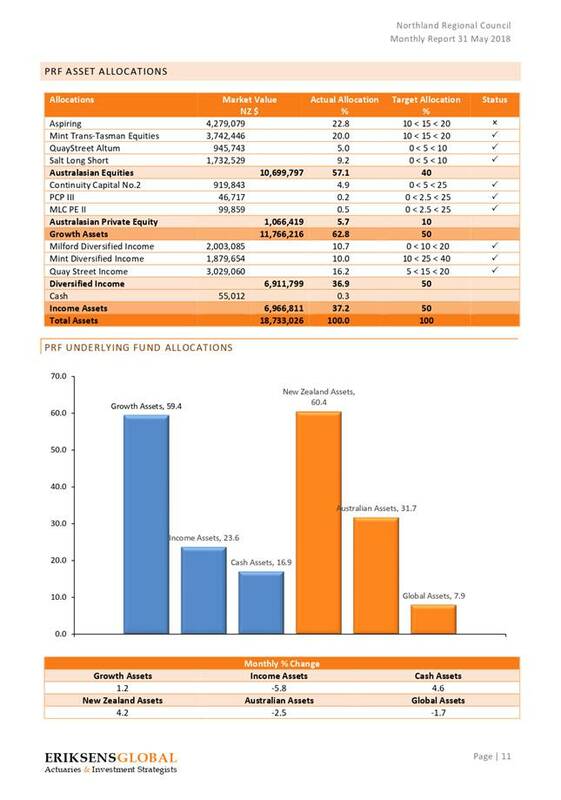 · The PRF has made more gains at the end of May than what was budgeted for the full year. · This would allow the budgeted operational funding contribution of $1,422,029 to be physically withdraw from the PRF. 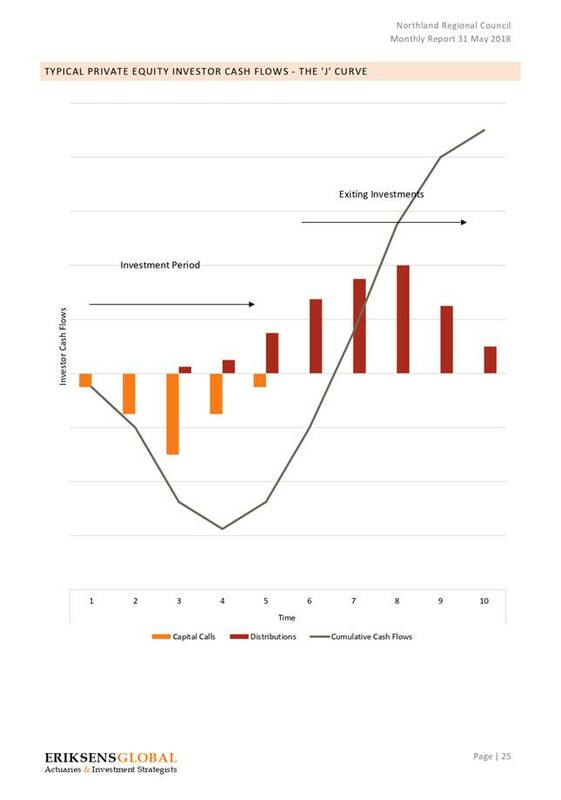 · After the above physical withdrawal, a reinvestment amount more than what was budgeted is still available (i.e. $159,302 possible reinvestment compared to a budget reinvestment of $118,361). · The performance for the month of June 2018 is still to come. Any additional gains in June would add to the $159,302 of possible reinvestment. · A negative result in June will reduce the level of gains that may be reinvested. In this instance, council may decide to put some of the withdrawn operational funding back into the PRF. 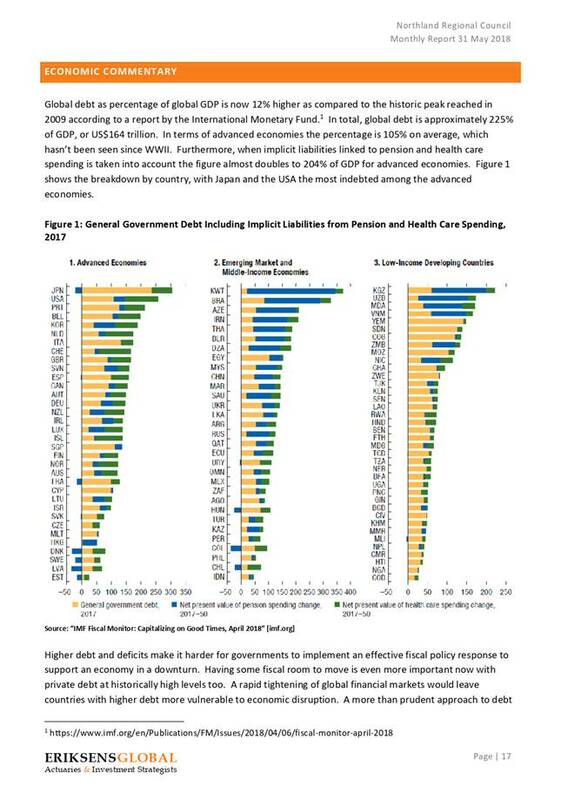 · The IIF has made more gains at the end of May than what was budgeted for the full year. · This would allow the budgeted operational funding contribution of $276,313 to be physically withdraw from the IIF. · After the above physical withdrawal, a reinvestment amount more than the zero budget is still available (i.e. $193,864 possible reinvestment compared to a budget reinvestment of $0). · The performance for the month of June 2018 is still to come. Any additional gains in June would add to the $193,864 as possible reinvestment. 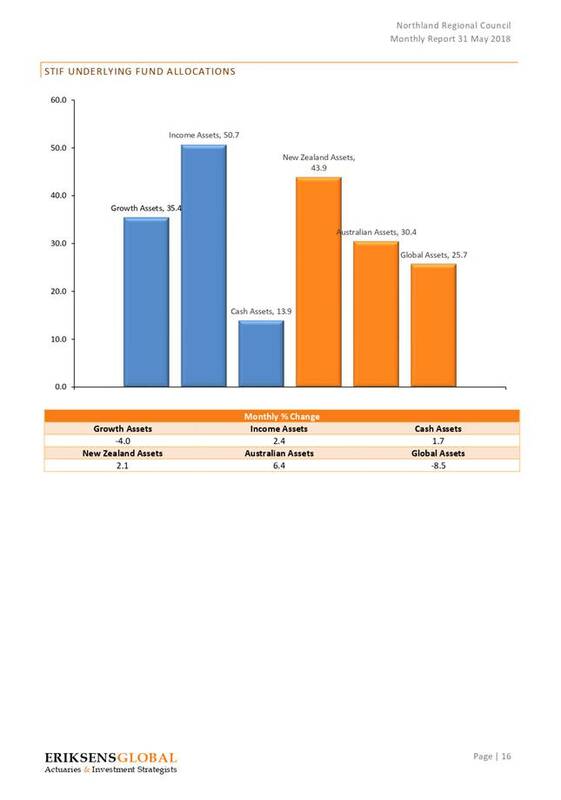 · A negative result in June will reduce the level of gains that may be reinvested. In this instance, council may decide to put some of the withdrawn operational funding back into the IIF. 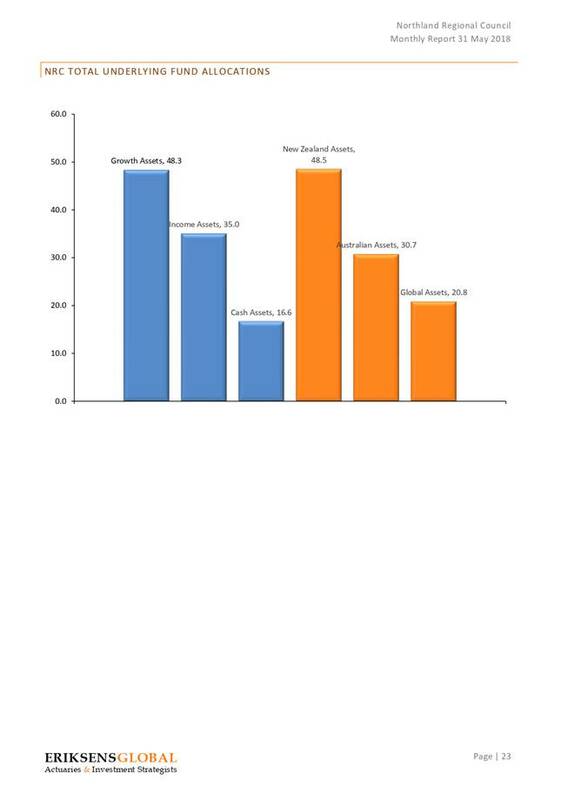 · The CIF has made more gains at the end of May than what was budgeted for the full year. · A reinvestment amount more than the budget is available (i.e. $1,029,180 possible reinvestment compared to a budget reinvestment of $642,690). · The performance for the month of June 2018 is still to come. Any additional gains in June would add to the $1,029,180 as possible reinvestment. It is desirable to physically withdraw the operational funding component of the gains in the 2017-18 financial year (i.e. before 30 June 2018). 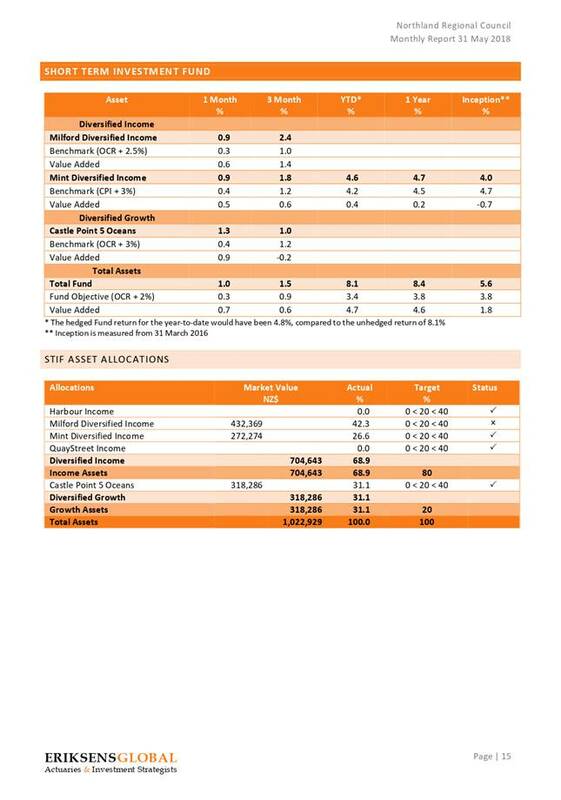 This allows the year-end financial statements to reflect an accurate fund asset balance. Council will ultimately finalise and confirm the reinvestment component of the gains (or direct elsewhere) at their August 2018 council meeting. The performance of a Fund in the month of June may be negative, and the total gains for the full year ends up lower than in May. This may require some withdrawn funds to be placed back into a fund to ensure the correct amount can be recapitalised. The final level of gains from each fund will be confirmed by the August 2018 council meeting and the withdrawal and reinvestment amounts will be conclusive. 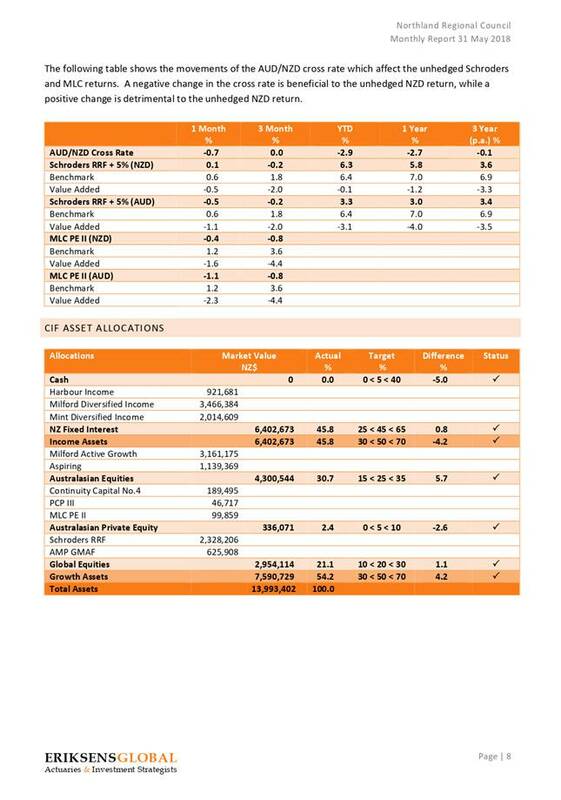 The Fund asset balances in the Annual Report will be overstated. In relation to section 79 of the Local Government Act 2002, this decision is considered to be of low significance because it is part of council’s day-to-day activities and is in accordance with the approved Treasury Management Policy and 2017-18 Annual Plan. 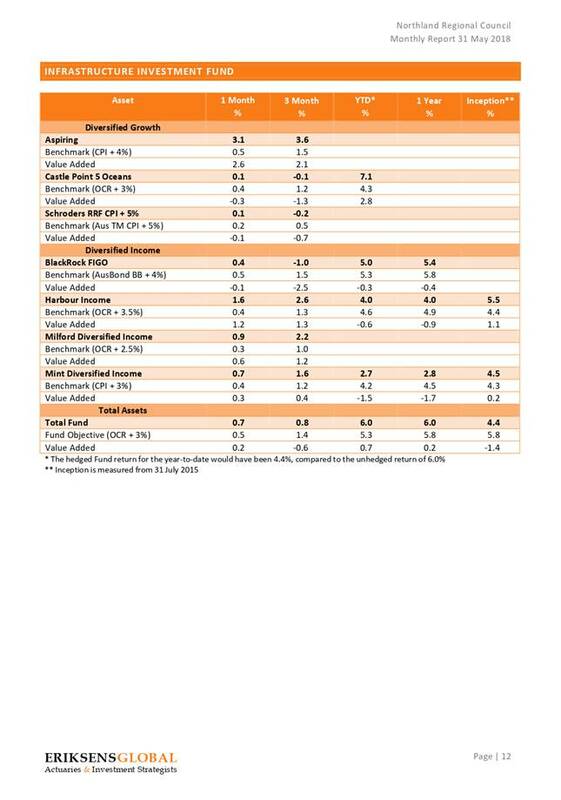 The activities detailed in this report are in accordance with council’s Treasury Management Policy, the 2015–25 Long Term Plan and 2017-18 Annual Plan, all of which were approved in accordance with council’s decision-making requirements of sections 76–82 of the Local Government Act 2002. Targeted consultation on the council’s intention to invest in, and withdraw from, externally managed funds was undertaken with iwi as part of the 2015–25 Long Term Plan consultation process using existing relationship channels. Investment strategies carry different risk profiles and are subject to different return volatilities. The returns from managed funds can fluctuate over a given time and period; and the returns over the year will not necessarily form the basis for a precited return for the final month of June.